A changing student population, with rising numbers of international students. Shifts in government priorities. Varied attitudes on the value of education. Aging buildings and skyrocketing demands for tech infrastructure. Dalhousie’s annual budget conversations don’t happen in a vacuum. They take place against this larger backdrop of change within higher education in Canada, in the Atlantic region and at Dal. “We have a context that sits within that larger one, forcing us to make tradeoffs and choices,” said Dal Provost Teri Balser, speaking at one of two campus budget forums this week. Each year, Dalhousie’s Budget Advisory Committee (BAC) — chaired by Dr. Balser as Provost — engages broadly with the Dal community in developing recommendations for the university operating budget. The budget, which last year was balanced at more than $428 million, funds the vast majority of the university’s daily activities: salaries for faculty/staff, student assistance, facilities renewal costs, strategic initiatives and more. 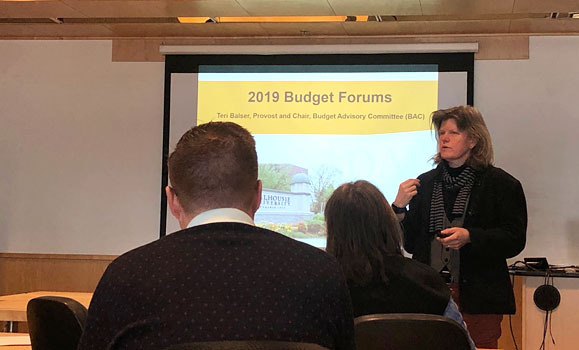 And this week, the BAC held two open discussion forums inviting members of the Dal community to learn more about the budget and engage in a discussion around priorities. Set in the Computer Science Building’s Jacob Slonim room (with an online web stream as well), Tuesday’s session began with Dr. Balser delivering a short presentation on the context for Dal’s operating budget. Following the presentation, participants broke into small groups exploring specific topics: tuition, enrolment changes, facilities upgrades, strategic investments, faculty complement and more. They were asked to consider how changes in these areas could influence Dal’s budget and vice-versa. All of the responses and contributions were documented for further BAC consideration. Up next for the BAC, following a second forum held on Thursday, will be considering what it heard across its early-winter consultations and prepare a set of draft recommendations for the operating budget — expected sometime in late February or early March. There will be further opportunity for feedback and discussion with the Dal community following that report. Still looking to contribute to the budget process at this stage? You can complete the budget survey by end-of-day on Friday, Jan. 25: student survey and faculty/staff survey. Comments are also welcome anytime at BAC@dal.ca.